Full disclosure. I’m a sucker for crossover events that involve my favorite childhood pastimes. So it should come as no surprise that I marked out ridiculously when the trailer for Scooby-Doo! WrestleMania Mystery hit the web. Think about this: as popular as wrestling was in the 80’s, Hulk Hogan never teamed up with our Scooby snacking canine. Now, our current crop of WWE Superstars join the historic lineup of such luminaries as The Three Stooges, The Harlem Globetrotters, and Batman and Robin for some mystery-solving shenanigans. The story isn’t that complicated, and it doesn’t need to be. It’s Scooby-Doo for crying out loud, and it has all of the usual elements that we’ve come to expect from this adored franchise. Velma, Daphne, Fred, Shaggy, and Scooby take in some leisure time in WWE City until a seemingly supernatural ghost bear threatens WrestleMania. It’s up to the gang to discover who is behind the fiendish plot. The usual suspects are introduced throughout the movie to throw off the scent of the real mastermind behind it all. As far as wrestlers go, John Cena is the star of the show and DAMN, he is strong. Like Superman strong. For his sake, I hope Warner Bros doesn’t conduct wellness testing. I kid, I kid. However, his wide array of skills come in handy. These skills include being able to speak “Masked Luchador” which is where Sin Cara comes in as the co-star and begs the question: who did Rey Mysterio piss off to get snubbed for the role? Sin Cara’s involvement actually serves the story well as his family legacy is linked to the legend of the ghost bear. Triple H has a strong presence but he doesn’t do anything important. However, he is holding the WWE title in every billboard, flyer and poster in the film. The cynic in me wonders if this was coincidence or by design? Brodus Clay and his funk-tastic dialog is short and sweet, AJ Lee is the furthest thing from a self-centered crazy chick, and The Miz is as annoying in animated form as he is in real life. Kane, Santino Marella, and Vince McMahon round out the superstars with speaking roles but there are also some non-speaking wrestler cameos. The voice acting clearly conveyed the amount of fun they were having in the recording studio which augmented their performance. Most of them spoke as exaggerated versions of themselves which is ultimately what a wrestlers gimmick is supposed to be. Let’s talk about WWE City. It’s a magical place full of sports entertainment themed shops, restaurants, gyms, and hotels. It also has the most messed up laws to ever pass legislation. Now, it is admitted that the action in the ring is all for show. Later on, law dictates that Shaggy and Scooby must compete in the very same ring in order to rule the day. Does this mean they got a fake beating or a real one? This is a little confusing, but I give the writers a pass on this one. 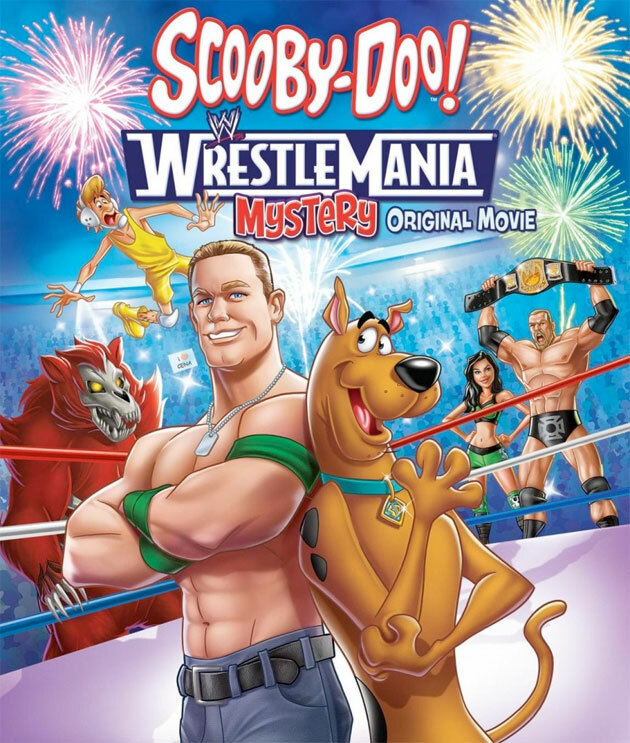 After all, this is a cartoon about a talking dog solving crimes with a professional wrestler. Suspension of reality is required. If you are a Ring of Honor loving, Daniel Bryan-worshiping, El-Torito-bashing son-of-a-gun, you will hate this movie. However, if you don’t mind an outrageously fun film that puts more emphasis on the WWE title than the actual company itself, your heart just might grow two sizes bigger. After all, it’s about the champ and those meddling kids!